My Place: When I am an old woman I shall wear purple…. Wow posting two days in a row! I was going to do just the Frida Kahlo post for PPF, as I didn't think I would be able to get any painting done today. But as you see I did even if it is still wet!. I really wanted to finish it as I think it would be great for Connie’s Mix It Monthly which ends in a couple of days. Last week while reading one of my favourite blogs that had a post on aging, one of the comments referred to this poem so I googled it. It is a poem by Jenny Joseph from “Warning”. Written in 1961. It really, really appeals to me. However, I promise not to spit! What will you do when you are old that you could start doing now? I think I will wear orange and pink with stripes and dots, and fall asleep while boring people are talking! Have a wonderful creative week and I hope to visit you all during the weekend. I've always liked that poem, and your painting is wonderful! I too have LOVED this poem forever and I wear purple and have a purple leather purse...and my friends all wear purple and shirts with the word noodle on it and bling...and we laugh and act young and you'd fit right in! We all love this poem and are becoming this!! Great artwork...glad you posted twice... I have missed all your yummy artwork! haha, perfect painting to go with that poem! I am so in love with your style of painting and beautiful bright colours. Happy PPF! I remember giving this poem to my mother years ago. It practically set her free! Love that open and great painting to go with it. fantastic illustration-love the poem too! wonderful poem and a lovely piece to go with it! You made me smile this morning, Sharon. I like this poem a lot but your painting is delicious! This really is such fun and fabulous art, wow! I love her, full of great character and that poem about getting old is wonderful, so important to lighten up and have lots of fun! I have become a bright color lady - no more dark colors for me (unless as contrast!). 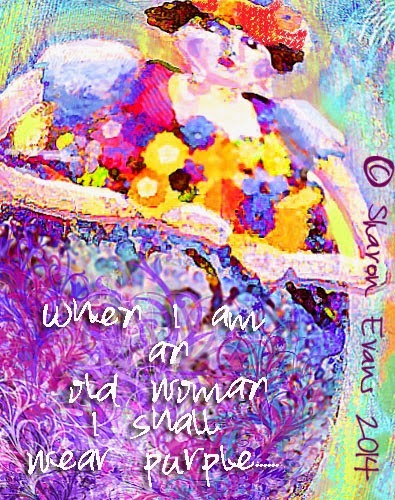 Wonderful poem and I love the painting - it so goes with the poem - whimsical and colorful! Love the bold strokes and colors in your painting - and I love the poem, too!